Bordering China and Vietnam, mountainous Phongsaly (Phôngsali) Province covers over 6000 square miles (41,000 km²) of northern Laos. Visitors to this frontier will find that the area is heavily influenced by the Chinese who have migrated, traveled and traded in this land for centuries. Phongsaly continues to be a major trading gateway between Laos and China. In the far north many restaurants, hotels and shops cater to Chinese merchants and business people, often displaying signs written in Chinese as well as the Lao language. 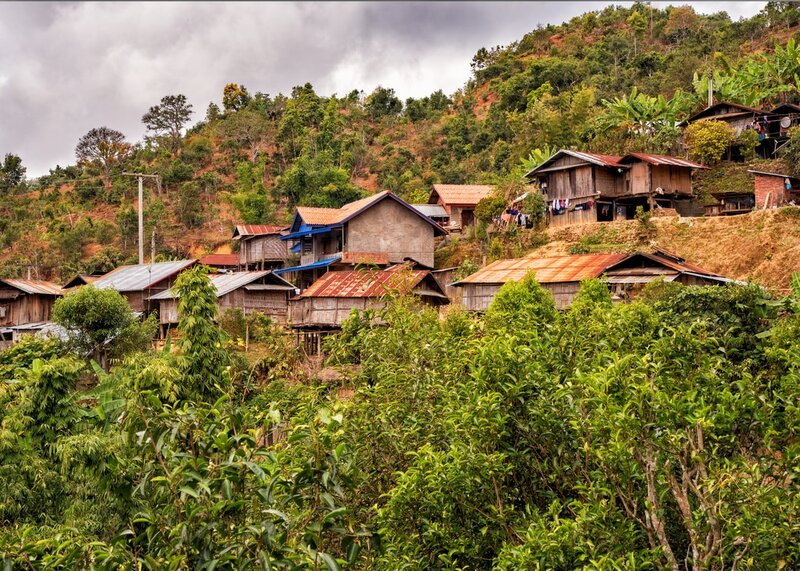 The majority of the province’s 177,000 residents are farmers as agriculture drives the economy of northern Laos. 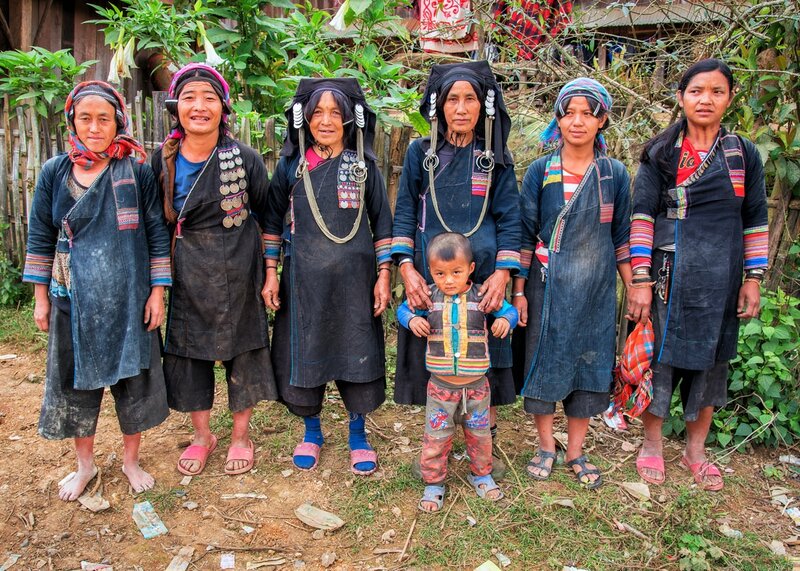 Inhabited by twenty eight different ethnic groups including the Khmu, Phounoy, Tai Lue and Akha, this remote region is rich in cultural diversity. ​At 4600 feet (1400 m) above sea level, Phongsaly town, the provincial capital, holds the distinction of being Laos’s highest city. Perched in the clouds on the side of Mount Phou Fa, the town sees few tourists as the general perception is that getting here is time consuming and difficult. To visit this remote town travelers definitely have to leave the main tourist route. However, in the past few years significant improvements have been made to the highways in rural Laos making the journey quicker and much more comfortable. The town has a number of simple hotels, guest houses and restaurants but do not expect to find any five-star accommodations or fine dining. The two main sights to see in town are the Chinese quarter and the pagoda (stupa) atop of Mount Phou Fa. Phongsaly town is small and compact. Both of these attractions can be combined into one outing and walked to. The Chinese quarter features narrow stone-paved streets lined with old wooden homes and shop-houses of traditional Yunnan Chinese style. Peek inside the doorways of these charming structures and you will often find a noodle shop or small restaurant. 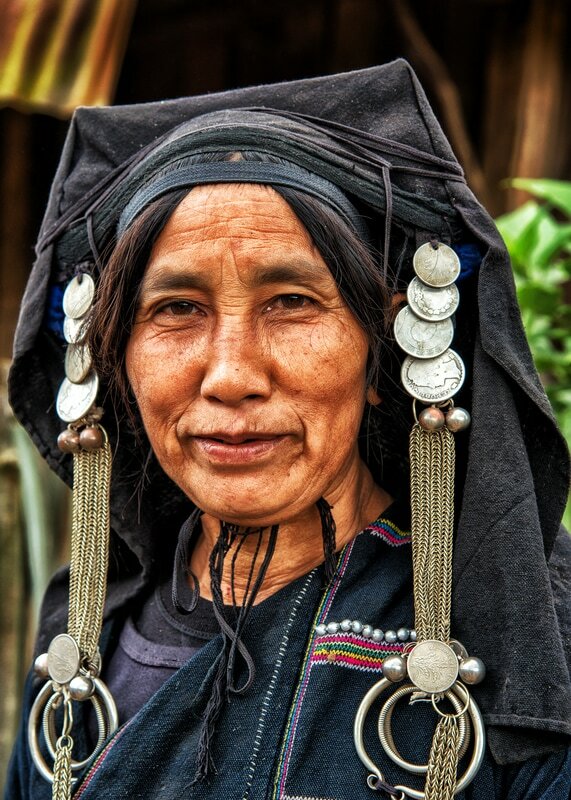 Phongsaly’s primary attraction is its rugged landscape and its proximity to ethnic minority villages. Trekking is the area’s most popular activity. Visitors normally choose to go on guided treks which can be a half or full day or multiple days with overnight stays in the villages. Travelers who wish do some self-guided trekking can walk to the villages of Ban Chantan and Ban Khounsouknoy. Inhabited by the Phounoy people, these villages are roughly 3 miles (5 km) from town and accessible by a well-traveled narrow dirt road. Touring the area by mountain bike or motorcycle is also an option; both means of transportation can be rented in town. Drive 11 miles (18 km) from Phongsaly town, and you will reach the village of Ban Komaen and the ancient tea fields collectively known as the 400-year-old tea plantation. No one can say with certainty how long tea has been harvested here, but it is believed that these trees were planted by the Chinese around 400 years ago. The ancient tea trees are cared for and harvested by the Phounoy people. After drying the harvested tea leaves, they are pressed and rolled into a unique cylindrical brick. The green tea “cigar” is then packaged in handcrafted bamboo tubes and exported to various countries in Asia and Europe. In addition to viewing the lush green tea fields, travelers can sample and purchase the cigar tea for the ridiculously low price of 25,000 LAK, or approximately $3 USD. Located in the same area is the tea “pavilion”, a traditional Lao home, which displays large place cards explaining the history of tea production in this part of Asia. A visit to this village is usually included in trekking and sightseeing tours and is one of the area’s most popular attractions. The plantation can also be reached independently by mountain bike or motorcycle. 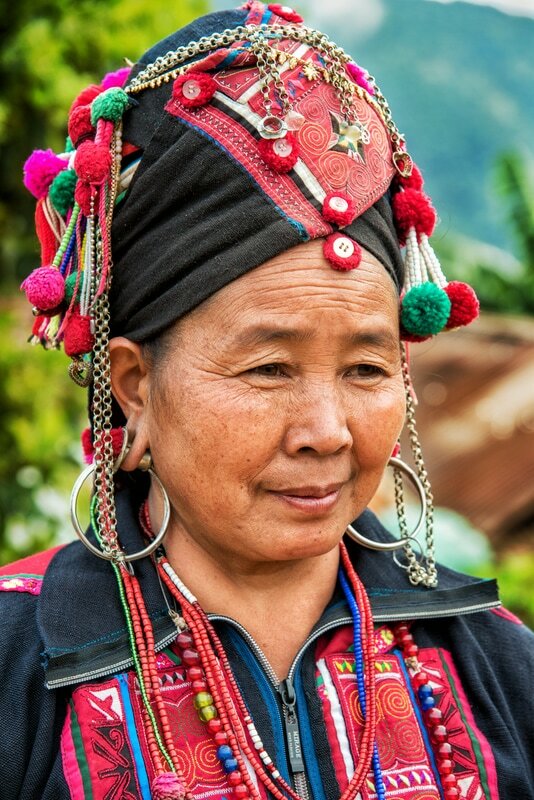 Inhabited by the Akha Oma people Namleng Village is perhaps the most visited village in the area and is usually included in both day and overnight trekking tours. It is the mainstay of Phongslay trekking due to its proximity both to town and the popular village of Ban Komaen. This is an authentic rural farming village and although it is visited frequently it is hardly a tourist trap. There simply are not enough travelers journeying to this area for anything here to be touristy. The chances of tour busses showing up here are non-existent as it can only be reached on foot or motorcycle. 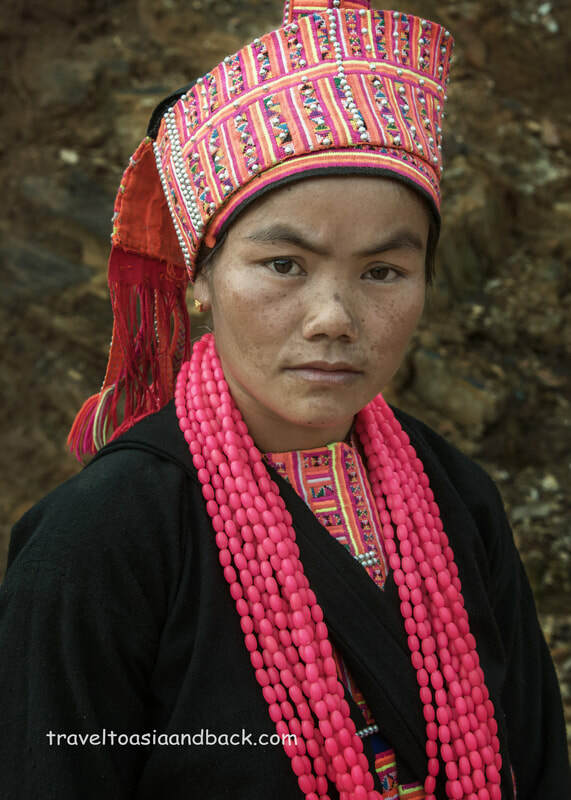 The Akha people who inhabit this peaceful village are very friendly and more than willing to pose for photographs in their traditional dress. The closest airport to Phongsaly town is 27 miles away (43 km) in Boun Neua (PCQ). In the past flights arriving from and departing Boun Neua have been suspended. The situation appears to change frequently. Currently (Feb 2017) Lao Skyway operates four flights per week from Vientiane. Departing Mondays, Tuesdays, Thursdays and Saturdays; prices for the one hour and forty minute flight start at 700,000 LAK or approximately $85 USD. From Boun Neua travelers can take a bus to Phongsaly for 15,000 LAK. Many budget travelers touring northern Laos will utilize inexpensive busses to reach Phongsaly town. Busses depart daily from Vientiane, Luang Prabang and Oudomxay. It is also possible to meet north-bound busses at Pak Nam Noy which is situated at the junction of Highways 1 & 2, 22 miles (36 km) west of Muang Khua. It is also theoretically possible to travel directly between Phongsaly town and Muang Khua by bus, but on our recent tour of the province this bus was not running. It should be noted that the bus traveling between Phongsaly town and the popular travelers’ destination Luang Namtha is only available to nationals of Laos and China. The bus station in Phongsaly is located (3 km) south of the town’s center and can be reached by van for 20,000 to 30,000 LAK. Traveling by boat is another transportation option that is very popular with visitors to this beautiful and remote part of Laos. Running 278 miles (448 km) through Phongsaly and Luang Prabang provinces, the Nam Ou River lies 7 (11 km) miles to the east of Phongsaly town. The river serves as a vital transportation link for the locals and their cargo. Travelers can make the journey between Muang Khua and Phongsaly by boat but it should be noted that a newly constructed dam breaks up the trip into several legs with a van ride in between. The cost for this eight or nine hour journey is approximately 120,000 LAK. ​Situated at the crossroads of Highways 1 & 2, 22 miles (36 km) west of Muang Khua and 40 miles (64 km) north of Muang Xai (Oudomxay), this tiny town is hardly a tourism hotspot. However, it is worth mentioning as its little bus station is a stop on the routes of various busses operating between Oudamxay, Phongsaly and Muang Khua. Home of the Akha Pala people, who you will meet on the road across from the bus station, the area’s scenery is simply gorgeous and the town is reputed to have an interesting weekend market. 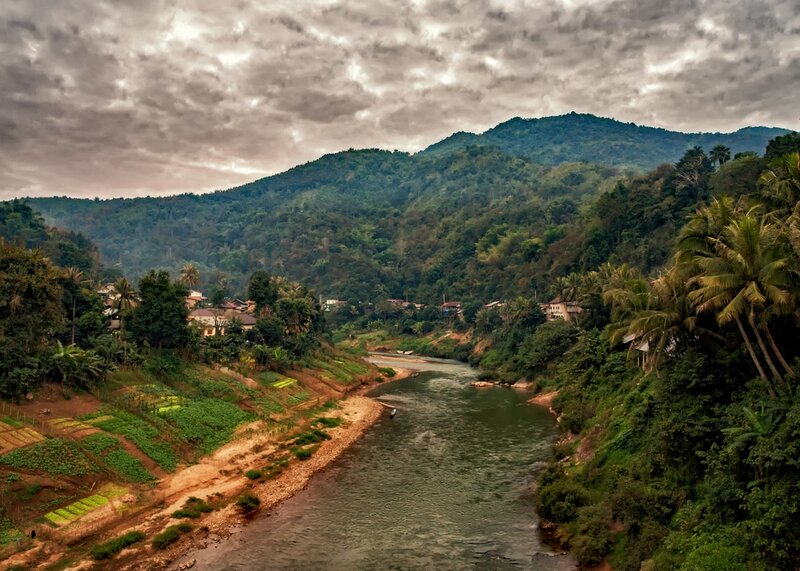 The small town of Muang Khua is a small transportation hub which is often visited, or at least passed through, by travelers exploring northern Laos. Located on the bank of the Nam Ou River, 42 miles (67 km) from the border with Vietnam, the town is a convenient stopover on the river journey between Phongsaly town and popular destinations such as Moung Ngoi and Nong Khiaw in Luang Prabang Province. As it is only a four to five hour drive to the Vietnamese city of Dien Bien Phu, Muang Khua is commonly a stopover on the long journey from popular Vietnamese destinations such as Sa Pa and Hanoi. Likewise, travelers exploring northeastern Laos will often stop here before crossing into Vietnam. The town has a number of small guest houses, many of which lie along a very scenic stretch of the Nam Ou River. The town’s center has numerous restaurants, convenience stores and a couple of ATM machines as well. 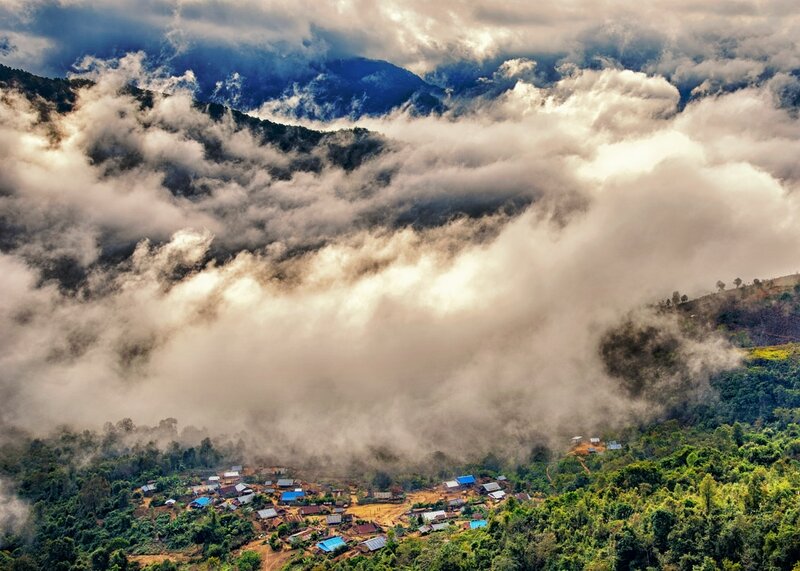 Surrounded by beautiful natural scenery, trekking among Muang Khua’s hills is its most popular attraction. Local guides organize single and multi-day trips which include visits to remote minority villages. Travelers crossing overland between Laos and Vietnam will pass through the Sobboun border crossing point located 41 miles (67 km) east of Muang Khua. Clearing out of Laos and into Vietnam at the Tay Trang checkpoint is straightforward and hassle-free. Travelers should be aware that on weekends and holidays the officials on the Laos side of the border charge a 10,000 LAK ($1.25 USD) over-time fee. With the exception of nationals from Japan and ASEAN countries, all visitors to Laos are required to obtain tourist visas. Tourists for most nations can acquire a visa on arrival at any of the country’s international airports and 13 land border crossing points (Jan 2017). Receiving a visa on arrival at Sobboun is quick, easy and costs $30 to $42 USD (depending on the passport holder’s nationality) for a thirty-day visa. The visa can be further extended up to sixty more days at the Department of Immigration in Vientiane. With the completed application, visitors will need to provide immigration officials with one passport-sized photograph and US dollars which are in good condition. We recommend only bringing dollars into Laos which are new and in pristine condition. This is particularly true for 100 dollar bills which are often closely scrutinized before being accepted.